Get to grips with the Rift's latest update. Patch 6.20 is finally here and it's time to take a look at the most impactful changes. The arrival of Ivern, the Green Father brings some exciting new dynamics to the Rift, while our resident Yeti seems to be making a frosty comeback. 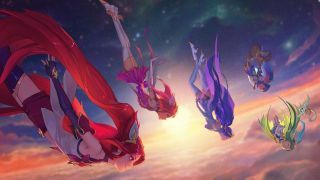 A little magic can also be seen, too, as the new Star Guardian Skins arrive in style. Discover the consequences for these changes below. Riot is making a slight change to the auto attack lockin frame and how it will work in future. This change is intended to primarily make the final frames of an attack a bit more predictable, especially within laggy environments. Now, movement orders issued .03 seconds before a basic attack fires will no longer cancel the attack. This is certainly a welcome change and will make auto attacking smoother and help players kite and CS better. It won’t be something that you will instantly notice when playing with the new patch, but it will significantly improve the overall experience of play. The latest champion to hit the live servers is Ivern, the Green Father. This friendly tree definitely brings a fresh new playstyle to the Rift and has mechanics that we have never seen in League of Legends. Ivern loves all the jungle’s creatures and would never harm them. Instead he chooses to set them free and is rewarded with gold and buffs for his kindness. This friend of the forest can also place bushes anywhere on the map allowing him to play mind games with his enemies, while he can set up kills for his team with Rootcaller. Ivern’s passive also gives him plenty of choice when it comes to taking buffs and jungle camps and allows him a great deal of flexibility when counter-jungling. The Green Father’s damage output may be on the weaker side, but his tankiness and ability to support his team more than make up for his shortcomings. Ashe has been a very popular AD carry pick, but the nerfs in patch 6.17 & 6.18 meant that she gradually fell out of favour. Despite this, Riot has continued to aim their sights on Ashe and this time they have targeted her Ranger's Focus (Q) ability. Instead of fully resetting Ashe’s basic attack, casting Ranger’s Focus now reduces her basic attack delay to 40% (no reduction if the delay is already below 40%). The Flurry damage has also been reduced so the Frost Archer’s opponents have a little more time to close the gap and a fairer chance of winning the fight. Cho’Gath has always been one of those champions that had the same cooldown times no matter the rank of the ability in question. This is now finally being changed. Feral Scream (W) has been reduced to 13 seconds and drops down to nine seconds at rank five, while the silence duration has decreased at rank two with 0.5 seconds being lost at rank five. This gives Cho’Gath’s Feral Scream a nine second cooldown as opposed to the original 13 seconds, allowing the Terror of the Void to use Feral Scream more frequently and create openings to deal extra damage. The range is being increased up to 650 from 585 to offset the “walking away in a straight line” issue. The changes will give Cho’Gath more opportunities to deal damage against his opposing laner and bring him back into the current meta. Jinx has enjoyed success thanks to the turret changes in patch 6.15. Her high DPS and mobility from Get Excited give the Loose Canon various opportunities to crush her opponents throughout the game. Riot has nerfed her Flame Chompers (E) by increasing the mana cost by 20, which will affect her early game as she will now have to be a bit more conservative when using the ability. The damage on Flame Chompers is also being reduced by ten at rank one and then up to 30 by rank five. This nerf shouldn’t be a problem for Riot’s resident psychopath as Jinx prioritises maxing Switcheroo and Zap first. Just make sure you don’t spam Flame Chompers - it's important to land it on your opponents. The biggest change in this patch is to the Yeti Rider, Nunu. We will likely see him become a very popular jungler once people start to realise his potential. His base attack damage has now been increased to 59 from 56.86 and his attack damage growth has increased to four from 3.45. Nunu now has access to his passive at the start of the game, while his Consume ability has been lowered and given a new effect called Feed the Yeti. For every Large or Epic Monster Consumed, Nunu gains ten out of combat movement speed and three per cent bonus max health for the next 50+5 per level seconds. The ability stacks five times and is not affected by Nunu’s death as they fall off one at a time. His ultimate, Absolute Zero now offers a movement speed slow that increases up to 95% over the duration of the channel. So the longer you’re inside Nunu’s ultimate, the more difficult it will be to escape its icy clutches. These changes will likely see the Yeti become a popular meta pick that will bring him to the forefront of the Rift in the weeks to come. Taliyah may have had a troubled release, but she is receiving a small buff to her base HP regeneration as well as lowered cooldown reduction on Threaded Volley (Q). The Worked Ground duration that plagued Taliyah’s performance in lane has now been decreased to 120 seconds from 140 seconds. This buff will hopefully limit the annoyance caused by the Worked Ground effect and allow the Stoneweaver to unleash more Threaded Volley’s in the laning phase. Vladimir always seems to be making patch notes headlines as Riot tries to find the perfect balance for the Crimson Reaper. The heal ratio from Transfusion (Q) has been increased to 35% AP from 15% which is a pretty decent buff. The healing reduction Vlad gets from minions when he uses his Empowered Heal has gone from 50% to 35%, allowing him to heal a bit more than usual. However, Tides of Blood is now more blockable (fatter and less missiles) and the AP ratio has been increased to 100% from 70%, but the health ratio has been decreased to six per cent from eight per cent. It looks as though Riot are trying to make Vladimir utilise more AP items to try and steer him away from the notorious tanky builds we’ve seen in the past.